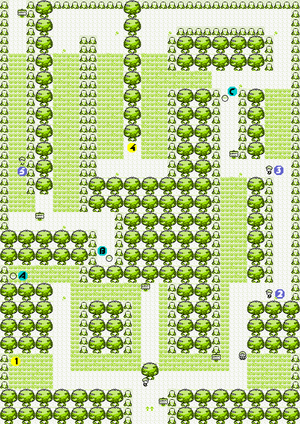 The Viridian Forest is smack-dab in the middle of Route #2, the route that runs between Viridian City and Pewter City. Pokémon are plentiful within its borders, and many trainers come here to capture new specimens for their collections and to challenge other trainers. It's easy to lose yourself in Viridian Forest if you don't know where you're going, so be careful! You'll find rival trainers everywhere you go, and they'll usually challenge you as soon as they see you. Trainers can have up to six Pokémon, and you can't Run from a battle with a trainer, so always be prepared for an extended battle. Keep in mind that the Pokémon that trainers use are often more powerful than the wild Pokémon found in the surrounding area. Viridian Forest serves as your first "dungeon" stage. It's hard to get lost here, but first timers may wish to explore it slowly to get a feel for the layout. As you cross Viridian Forest, you'll be attacked by wild Pokémon and challenged by other trainers. While encounters with wild Pokémon are random, trainers will only come at you when you cross their line of vision, so you have a degree of control over when they challenge you. Unfortunately, they are usually placed in positions that give you no choice but to pass in front of them, although a few can be avoided by walking around them. However, the behavior where trainers can't change the direction they are looking at is only this way in Generation I games. If you are having trouble defeating trainers in a given area, it probably means that your Pokémon aren't strong enough and need to be leveled up more. The highest level Pokémon that a trainer in Viridian Forest has is a level 9 Weedle in Red and Blue and a level 10 Caterpie in Yellow, so as long as most of your Pokémon are level 8 or above, you should be in good shape. If you caught Nidoran and Spearow on Route 22, you're golden - Nidoran's Poison-type means you can soak up Poison Stings from Weedle, and Spearow's Peck has a type advantage against Bug-types. The Pokémon that you encounter in the forest may seem tough, but most of them won't be. Wild and trained Kakuna and Metapod can't attack, only using Harden to raise their Defense (which can make for some long battles that wear down your Pokémon's PP, so be careful). These two also give lots of experience when defeated, so use your weakest Pokémon when fighting them. Never try to capture a wild Metapod or Kakuna. Instead, capture Weedle and Caterpie and level them up so that they evolve into Kakunas and Metapods while retaining their old moves. They evolve fast: both will be at their third stage of evolution by Level 10! Definitely capture a Caterpie and raise it to Butterfree, especially if you chose Charmander as your starter. Pikachu are extremely rare in Red and Blue (and non-existent in Yellow, since you already have the one and only as your starter) and will take extensive periods of walking around through grass to find them. It isn't necessary to capture one, but they can deal with Flying-types and Water-types with ease, and it'll be awhile before you can catch another Electric-type Pokémon. While they are at first very low leveled with awful stats, it becomes a great fighter when it evolves into the much stronger Raichu. Pikachu can be found throughout Viridian forest. As you enter the forest, take the path on the left side of the large tree ahead to find a hidden Antidote in the big tree (which you could need against the trainer at the end of Viridian Forest with his Weedle's Poison Sting having a chance of poisoning your Pokémon in the Red and Blue versions), and directly in front of Trainer #5 is a hidden Potion. If you invest enough time in Caterpie, it will end up as a Bug- and Flying-type Butterfree that can gain status causing moves such as Stun Spore and Sleep Powder, as well as a basic Psychic-type attack in Confusion. Butterfree can be extremely helpful in the early portion of the game. However, Butterfree is quickly out-classed by other Pokémon such as Bellsprout and Oddish as a status-inflicter, and Kadabra and Hypno in terms of Psychic power. It gets its moves earlier in Yellow, and even learns a new one, but it's still not much of a late-game Pokémon. Weedle doesn't start out much differently than Caterpie. It's pretty weak when you get it, and evolving it into Kakuna doesn't make things much better. But Weedle's evolution continues at a lightning pace, and at level 10 you'll have a very useful (at least for the early part of the game) Beedrill. Beedrill learns the best Bug-type attack, Twineedle, at level 20, but Beedrill's Poison-type and low stats make it pointless as an anti-Psychic Pokémon. Good until around Rock Tunnel, where you may want to consider finding a replacement. Pikachu is quite different in Red and Blue than in Yellow. It lacks Thunderbolt by level-up, so you'll have to use a TM in Vermilion City. It gets Swift, but at the expense of Double Team, Slam, and even Light Screen later on. The big advantage is that Pikachu can evolve, giving it good stats and making it much stronger in the long run. Definitely a good Pokémon to pick up, particularly if you chose Bulbasaur and need a Flying-type counter. If you have a Pidgey, it will evolve on its own at Level 18. But, if you have Yellow, you don't need to wait! Rare, evolved Pidgeotto can be found in Viridian Forest. These are superior to Pidgey because they have higher stats right off the bat, making them harder to catch but easier to raise and battle with. Although they are evolved forms of Caterpie and Weedle, Metapod and Kakuna (the latter unavailable in Yellow version) are very weak. Their only move is Harden, which does no damage, whereas one evolved from a Caterpie or Weedle would have the previous stage's moves. If you want to, catch the first stage instead. This page was last edited on 22 July 2016, at 13:17. This page has been accessed 917,476 times.